Feel how you will about Freud and his eccentricities, hypocrisies, and sexist paradigms; he is still the fountainhead of the landscape of psychiatry as a field today. And the fountainhead behind Freud was art. Freud was an obsessive collector of rare art objects from antiquity, with a refined and educated eye similar to that of a museum curator or an archaeologist. He was fascinated by ancient art as deeply as he was by study of the mind, and had a lifelong love affair with the process of collecting. Psychotherapy itself mimics the archeological process – uncovering layers of the past to reveal hidden strata of the psyche. Freud’s love of art was intertwined with his quest to understand the psyche; each pursuit would not have been possible without the other. Sculptural figures of the human form from a variety of ancient civilizations, including Egyptian, Greek, Etruscan, and Asian were used by Freud as a visual means of contemplating universal human myths, archetypes and psychological forces. 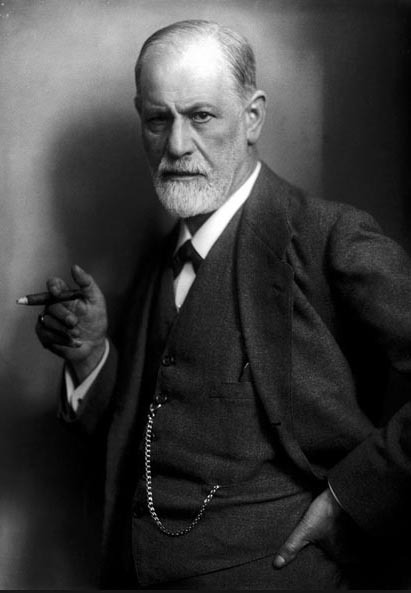 Freud described his art collection as a “personal microcosm” of his own psyche. Jung, influenced by Freud, was also obsessed with art and archetypes, as evidenced in his seminal work Man and His Symbols, which was integral to the birth of the field of modern psychiatry. The ancient Egyptians are qualified as the “first aesthetes” by social critic Camille Paglia, because of their reverence for style, form, and grace. 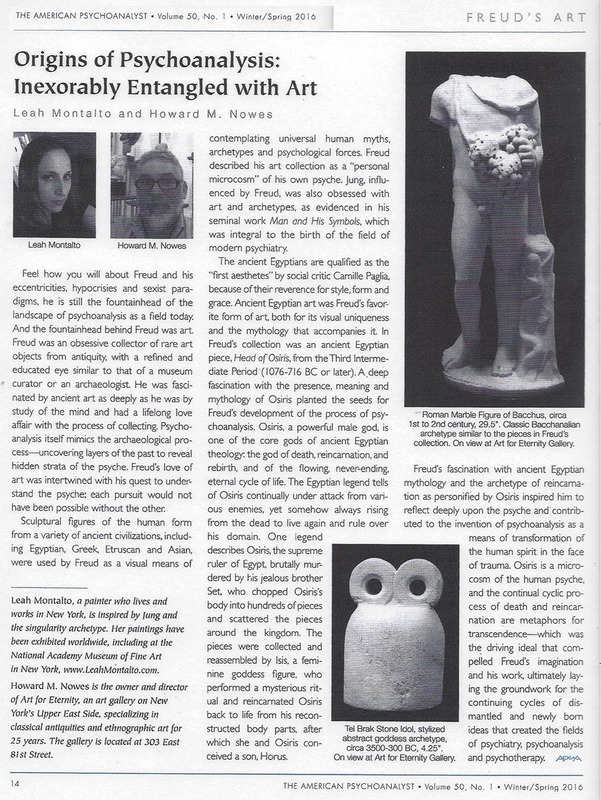 Ancient Egyptian art was Freud’s favorite form of art, both for its visual uniqueness and the mythology that accompanies it. In Freud’s collection was an ancient Egyptian piece, Head of Osiris, from the Third Intermediate Period (1076-716 BC or later). A deep fascination with the presence, meaning, and mythology of Osiris planted the seeds for Freud’s development of the process of psychoanalysis. Osiris, a powerful male god, is one of the core gods of ancient Egyptian theology: the god of death, reincarnation, and rebirth, and of the flowing, never-ending, eternal cycle of life. The Egyptian legend tells of Osiris continually under attack from various enemies, yet somehow always rising from the dead to live again and rule over his domain. One legend describes Osiris, the supreme ruler of Egypt, brutally murdered by his jealous brother Set, who chopped Osiris’ body into hundreds of pieces and scattered the pieces around the kingdom. The pieces were collected and reassembled by Isis, a feminine goddess figure, who performed a mysterious ritual and reincarnated Osiris back to life from his reconstructed body parts, after which she and Osiris conceived a son, Horus. Freud’s fascination with ancient Egyptian mythology and the archetype of reincarnation as personified by Osiris inspired him to reflect deeply upon the psyche, and contributed to the invention of psychoanalysis as a means of transformation of the human spirit in the face of trauma. Osiris is a microcosm of the human psyche, and the continual cyclic process of death and reincarnation are metaphors for transcendence - which was the driving ideal that compelled Freud’s imagination and his work, ultimately laying the groundwork for the continuing cycles of dismantled and newly born ideas that created the fields of psychiatry and psychotherapy.